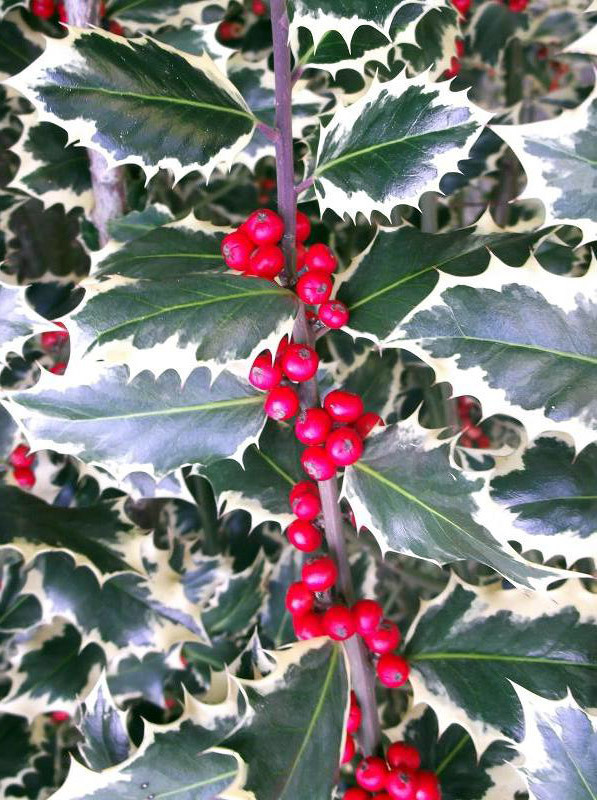 Holly comes in many varieties besides the familiar Christmas sort. The leaves are always evergreen and usually prickly, they are very useful slow growing trees that can be grown as a hedge or specimen shrub. Some have smooth leaves - no prickles, some have prickles on their prickles, some have berries on their own, some have berries only if a partner is around and others don't have berries at all. Hollies are either male or female, only females have berries and usually only if there is a male around for pollination, though a few types are self fertile. Most berries are red, but some have orange or yellow berries. The leaf colour varies from bright through dark green and many are variegated with cream or yellow leaf margins. "I would like a self fertile holly, with dark green prickly leaves and bright red berries (as you imagine Christmas holly to be!) to reach about 6' tall - is there such a thing, please?" Sorry, but there isn't such a thing. The options are "J.C. van tol." Which does what you want but has smooth leaves, or get an ordinary species plant and plant a male somewhere nearby. The female for berries should be in the best and sunniest place to "power" the berries when they start to develop. The male can be planted somewhere rather more out of the way. As for height, they will all keep going to about 20 feet or more (in time). You can trim them, though this will change their shape. "ferox argentea", hedgehog holly. An unusual variegated holly - green leaves edged with cream - that has spines on the surface of the leaves as well as around the edges. Slow growing, colours best in a sunny position. Eventually gets to 25ft high by 12ft wide, but easily trimmed to less. "J.C. van tol" A reliably self-fertile and the closest to a perfect holly that we have, the draw-back - or not depending on how you see it - is that the leaves are smooth without the traditional spikes. To 20ft tall by 12ft wide, like all hollies, fairly slow growing. "Silver Queen" - variegated green / cream, male. "Mme. Briot" variegated green / yellow, female, red berries. Height and spread: varies greatly according to variety, potentially to 25m x 8m (80ft x 25ft) though rarely attained, especially by named cultivars. Soil: moist, well-drained neutral to slightly acid soil, though fairly unfussy. Other Features: makes a good security hedge, or will help to protect an exposed downstairs window if planted below it. Pruning: Usually requires minimal or no pruning. prune in late summer if necessary. Will usually respond well (if slowly) to renovation and drastic cutting back, stage this over 2 or 3 years if possible or be prepared for a long wait. Q. I have two Ilex JC van Tol planted a couple of months ago. They seemed to be doing well, at present they have plenty of flowers. However some of the leaves on both have started to turn yellow. I have watered & fed them. Can you advise if this yellowing is normal for these hollies. A. Hollies discard their older leaves around May, it's perfectly normal and they'll soon be replaced. Q. I have a 30ft holly tree in my back garden it flowers but has never had berries. About half of the leaves do not have spikes on them, and are yellow. The tree is riddled with leaf miner It is dropping about 100 leaves everyday I have been picking them up every day for about a year and have seen no improvement. Also the trunk of the tree is covered with a green algae like residue. The tree is beautiful and I would really like to help it back to health but I feel it might be to late. 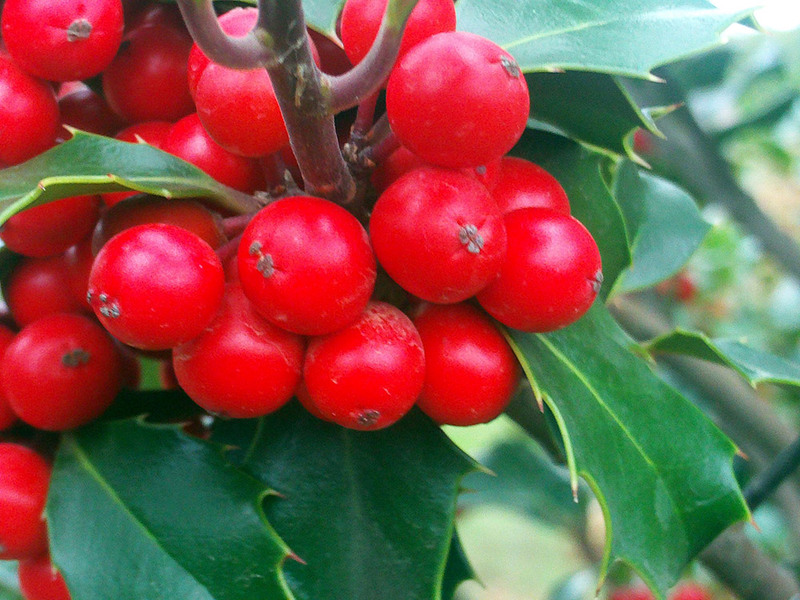 In all probability, your holly tree is a male, only females have berries, hollies are one of the relatively few plants that have males and females. If you want berries, I'm afraid you'll have to get some female plants which will be pollinated in order to set berries by your male plant. Lack of spikes in itself is nothing to worry about, this is a factor of the variety of holly and also possibly a characteristic of that particular tree. Yellowing leaves and so many dropping might be something to worry about though. All evergreen trees do drop leaves almost continuously as they are replaced. As it's been going on for a year it may just be that there's so many as the tree is large. On the other hand, is it getting noticeably more thread bear? It should be able to maintain an equilibrium of fallen leaves with newly sprouted leaves. Hollies are susceptible to attack by leaf miner. If the infestation is heavy you can spray it with a systemic insecticide, but this will be a fairly large job and require a sprayer able to deliver large quantities and broadly - a hand sprayer will either not do the job or build your forearms up so you could crush a billiard ball. Spray as soon as possible and repeat in a month or so, maybe again a month after that. If you want to be organic about it, you could crush the leaf miners in the leaf with your thumb nail, though I guess this is pretty impractical with the size of the tree. Is it stressed in any way that might make it more likely to come under heavy attack? The algae is nothing to worry about, brush it off with water and a stiff scrubbing brush if you find it unsightly, though it will come back. It will also help to feed the tree if it's under attack, I'd use blood fish and bone meal, or bone meal, you could use inorganic Gromore or something similar. Depending on what's under the tree, spread the fertiliser in a circle about 6 feet radius around the trunk, hoe into the soil and water in liberally. Q. I've let my established holly hedge grow both outwards and upwards too much. Have had complaints about it obstructing the adjoining footpath and requests that I cut it back. But to bring it back in line with the boundary wall behind which it grows I'd lose all the leaves and expose the leafless core of the hedge. What can I do (and when?) to maintain the hedge but satisfy the complainants? A. Holly does respond to drastic pruning, but as it's slow growing and evergreen such pruning is usually carried out over 2 or 3 years. The best time to do it is late summer, though, you may have little choice in this. Generally the younger and smaller the plant is, the better and quicker it will respond. Make sure you leave a reasonable amount of foliage on the plant , i.e. remove no more than about 1/3rd in any one go. If most of the plants is on your land and facing the "other way" from the wall with plenty of leaf on that side, it shouldn't matter about cutting back to the brown leafless core. The 1/3rd applies to the whole plant, whole branches can be removed. It should recover in time, but it will be slow before the brown side is green and leafy again - 2 to 3 years maybe, you'll see some growth in the first year, but it will take time to recover properly. Q. I am thinking of purchasing a standard (or maybe it is a half standard) Ilex aquifolium J C van tol which I have seen in a garden centre. It is about 5/6 foot high (Ãƒâ€šÃ‚Â£150!) It is a lovely specimen, covered in green berries, and it is would suit where I plan to plant it just as it is. How can I keep it roughly the size it is, as I note it has the potential to grow very tall, and I don't want this. If pruning is the answer, when is best and by how much, please. A. Such topiaried specimens are fairly easy to keep to size, the main thing is to remember to do so and not leave them for any length of time - a little trimming on a regular basis is the key. Holly is slow growing so it shouldn't be too much of a race! How quick it grows depends on how where it is. I'd leave the first clipping until at least May-June and then another in October to curb the growth - though holly can take clipping at any time. Just keep on trimming back to where it is now, tidy up to the neat ball it is at the moment when it's produced some new shoots. The important thing is to use secateurs or something similar and snip through the stems when shaping it, larger shears will cut through leaves which will then go brown from the edges and leave an awful mess. Another point - if you are to plant it in the ground rather than being containerized, I'd leave it until the autumn and this current spell of hot weather is over. Plants always take a knock-back when planted into the ground and it will help minimize the shock if you wait until less stressful times. Q. Friends of ours have just cut down a large Holly Tree, we asked if we could have the large trunks & branches as they would make ideal perches for our parrots. When we got them home we cleaned them off with the pressure washer, & was surprised that all the bark came off & the trunks are a lovely clean cream colour. But our main question is are they poisonous to Parrots? A. This is a too specific question for me to be able to give anything but general advice for you to make your own decision - not being a parrot expert. 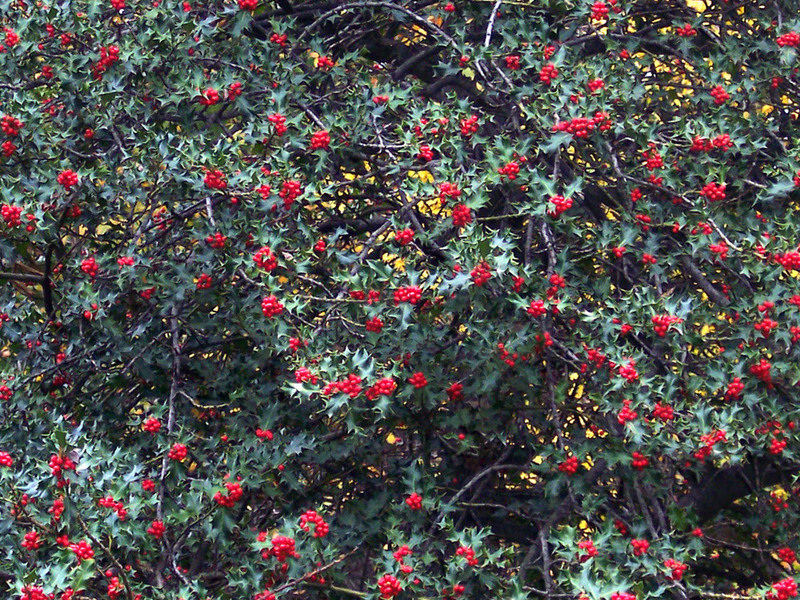 Holly berries are poisonous to humans, but not to many animals and birds that will readily eat them with no ill effect. 20-30 holly berries ingested in one go is reputed to be fatal to small children, though there is no solid evidence of this, diarrhoea and vomiting are the usual reactions. Holly twigs have been fed to cattle in the past as feed. 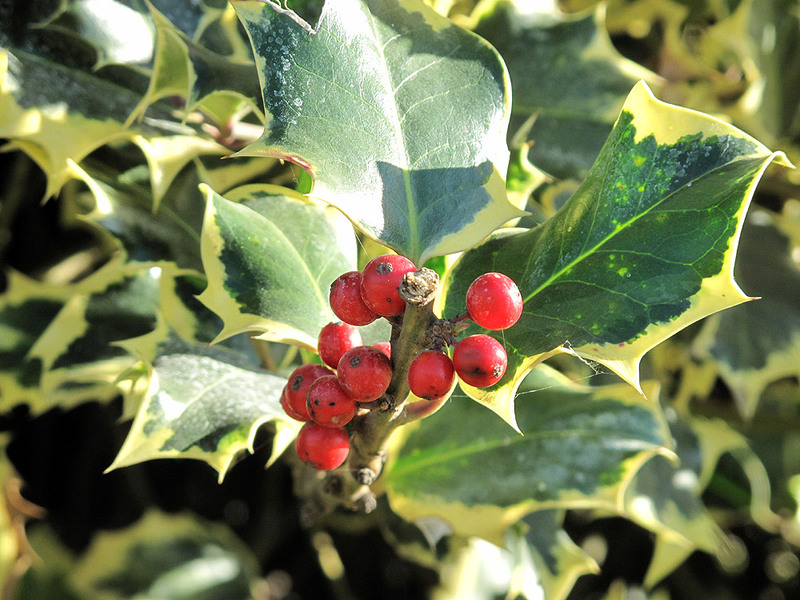 Holly branches can also be provided for rabbits which may be gnawed and regarded as something of a tonic. Holly has been widely used as a decorative wood for centuries with no ill effects to the people coming into contact with it. Toxins are usually found in plant leaves, berries and bark. 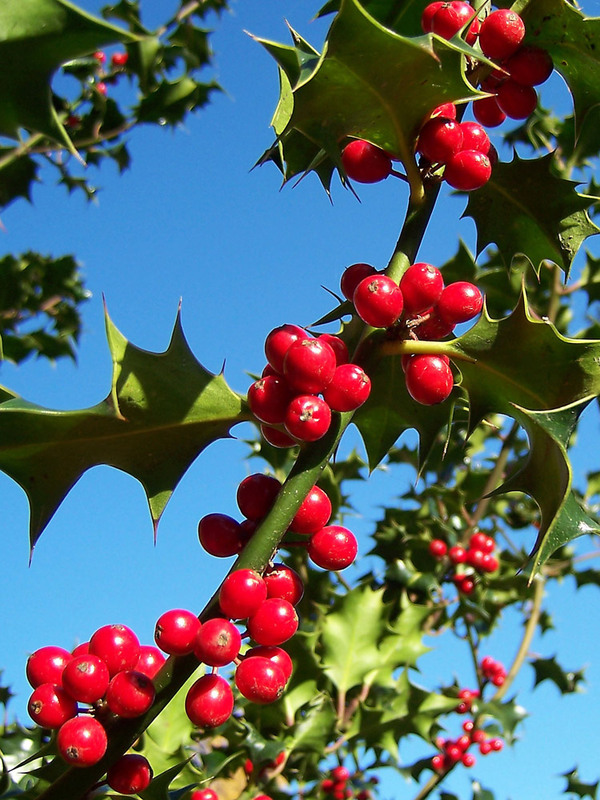 My feelings are that the warnings about holly being poisonous only really apply to the berries - and even then it only really applies to humans. There will always be odd reactions of animals to plants though and holly is not something that parrots would naturally come across in the wild. Will they just sit on the branches or rip into them and consume them? Q. Are all varieties of holly equally beneficial to birds/wildlife? A. 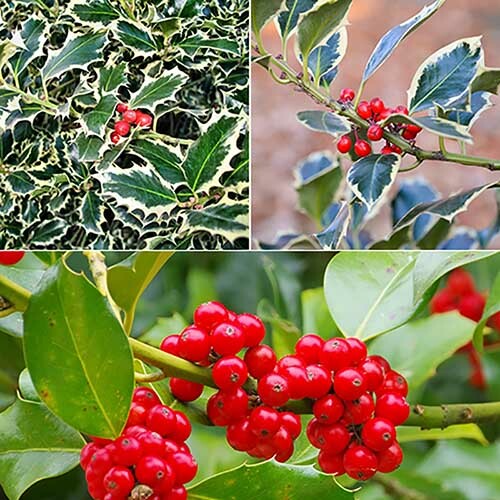 The best one is the native holly, generally the more ornamental and removed from the basic species a plant is, the less attractive to wildlife it will be. If you plant holly, remember that many are male or female, female have the berries, but a nearby male is needed for pollination. 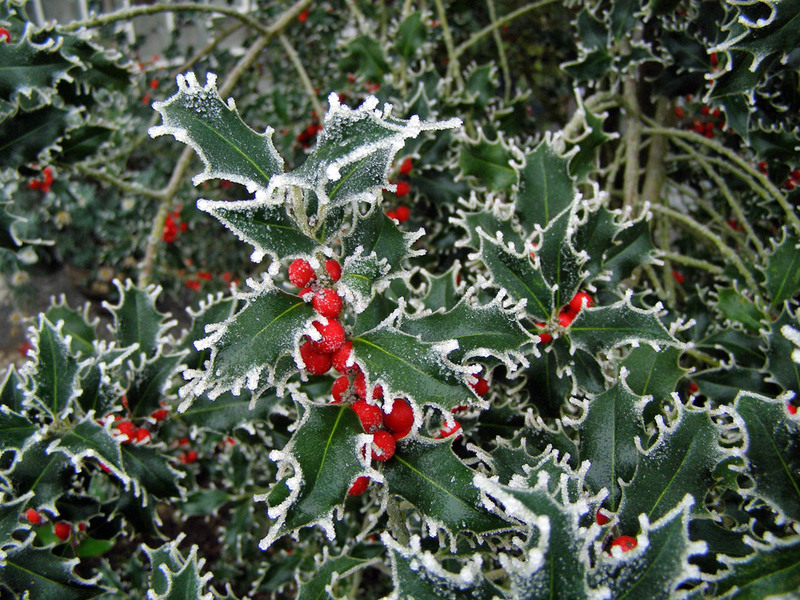 Q. I'd like a holly hedge and think Ilex aquifolium "Ferox argentea"/hedgehog holly looks pretty and will stop intruders. How quickly will it grow to 2m+ tall? A. Slowly, how quickly depends on the specific conditions. 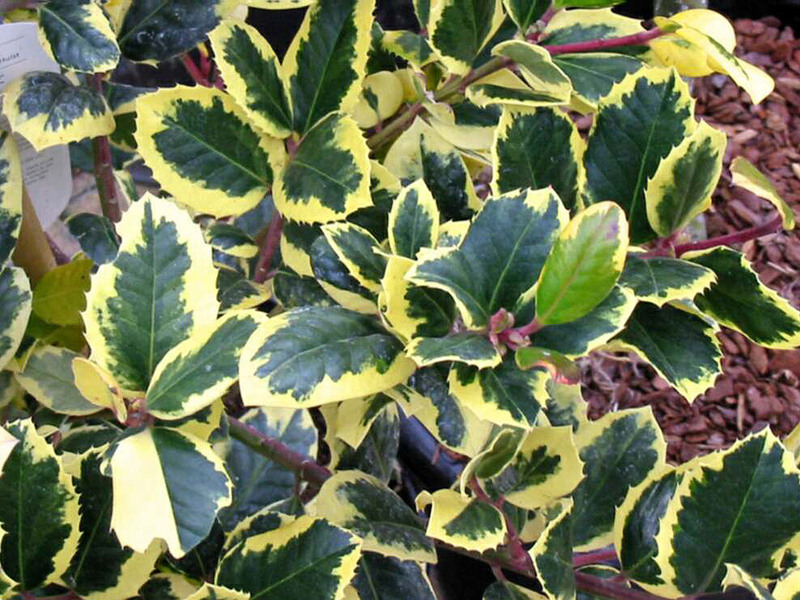 Holly is pretty slow growing and variegated varieties more so. It will be a fine and attractive hedge, but you're looking at around 10 years to get that high and start to thicken up. Q. I have several holly bushes, some are standards. There are a few varieties, such as a light green/cream variegated and a black stemmed version. The variegated standard has started to loose loads of leaves, literally about 50+ per day and seems to have some sort of little bug on the leaves. The others trees have now got this little but on them. Do you have any idea what it might be and how to treat these shrubs? The are so lovely it would be a great shame if they died. A. Holly tends to lose leaves around this time of year (May), though they should be replaced with new ones more or less immediately. I'd spray as soon as you can with a systemic insecticide (check the label), these are taken up by the leaves and transported around the plant to be taken up by any pests when they feed on the leaves or sap - not the soapy ones. The chances are if the hollies are large and established they will recover, but will look ill for some time and there's the chance the pests will come back. I'd give them a helping hand with an appropriate chemical spray. Photo credits: (numbering left to right top to bottom) 1-A Barra Hol - Creative Commons Attribution 3.0 Unported license. / 2- Emoke Denes Creative Commons Attribution 2.5 license / 3- Erich-Ferdinand Creative Commons Attribution 2.0 license / 4-Ilex aquifolium aureomarginata Public domain / 5- / 6-Jurgen Howaldt - Creative Commons Attribution 2.0 license. SaS Germany / 7-Spedona - Creative Commons Attribution 3.0 Unported license.